Let’s talk about Movies – Would I Wear it in Paris? 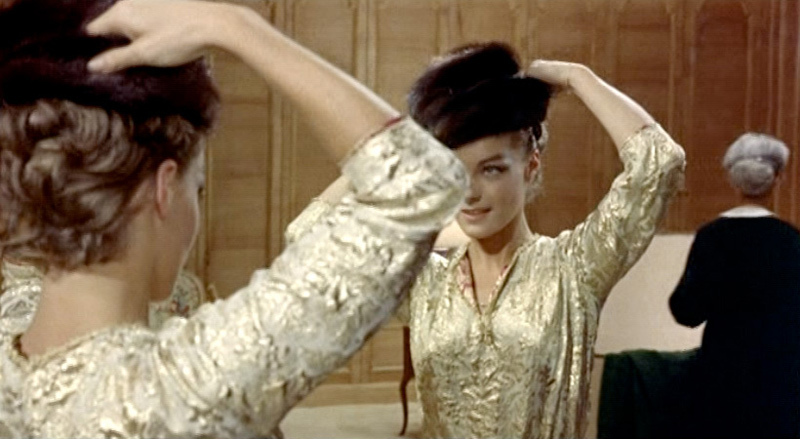 That’s Romy Schneider in Boccaccio ’70. It’s about–well, I can’t remember exactly, but I believe she was dressed in Chanel for it. Maybe some Dior. Catch her in What’s New Pussycat too for more great style. I love this movie. I love Rosalind Russell and her smile. My favorite outfit from this movie is the brown one on the left. It’s hard to see, but those are cigarette pants and a billowing skirted jacket over them. This is from Three Coins in a Fountain. It’s a silly, insipid movie with sillier characters. But it does feature some beautiful, idyllic scenery in Italy and awesome clothes. Next time, I think I’ll watch it with the sound off or some friends so we can make up out own dialogue. That’s all for now. I’ll try to round up some more of my favorite style and fashion movies for future posts. But send me your recommendations. I’m sure I haven’t seen them all. i totally wanted to be a lady memoir writer so I could dress like Mame Dennis!